To conduct world-class science you need world-class equipment and facilities and at University of Plymouth we have access to the right tools for the job. The facilities and equipment described below represent a substantial investment and are available to support any research or commercial project that is conducted by our staff and our partners. The name honours Robert Falcon Scott, who as a Plymothian naval officer and polar explorer attempted to be the first person to reach the South Pole. The Falcon Spirit is a 13.65m survey vessel coded by the Maritime and Coastguard Agency for 14 people to work up to 60 miles from safe haven. Built by Alnmaritec of Northumberland the RV Falcon Spirit is an aluminum catamaran. With a beam of six metres it offers a large and stable 25m of flood lit configurable aft deck space. Internally the vessel has dry laboratory space for a minimum of six workstations, plus a separate wet laboratory facility. With a pair of 500 horse power diesel engines the vessel is capable of a 165 mile range at a 15 knot service speed, with considerable power in reserve. The vessel comes with the capability to troll at very slow speeds and boasts a 1 metre by 1 metre moon pool, two independent 600kg hydraulic capstans, and a 400kg pot hauler in way of a double door in the starboard bulwark. Power is via an independent generator producing 12.3 kVa of clean power to a multitude of 240V sockets, a 1.6kw inverter and a 4kw UPS. 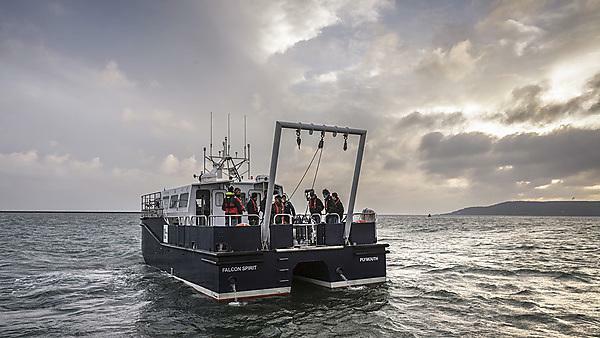 The RV Falcon Spirit offers a flexible and state-of-the-art platform for marine research. The multi-beam echo sounder system is used on board Falcon Spirit and can accurately measure latitude longitude and the height of seabed features up to 400 meters below the surface. It is used for teaching, research and in partnership with commercial companies for hydrographic and other underwater surveying. The system enables students and researchers to map the subsurface environment and visualise in detail features such as shipwrecks. MCA Cat 4 with 10 P.O.B./ Cat 2 with 8 P.O.B. Boat mounted davit with 3.65m radius jib,worked with hydraulic winch. Note: operational limitations on slew angle, and area of operation i.e. Permitted area inside the Breakwater. View the video about Falcon Spirit.